Blam! 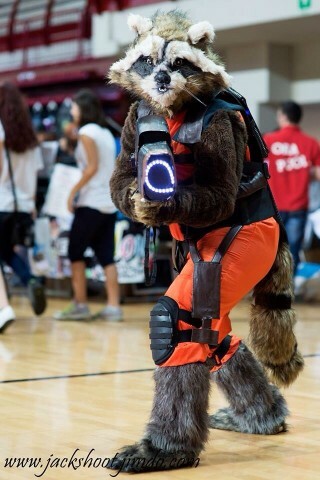 It’s a Rocket Raccoon Costume « Adafruit Industries – Makers, hackers, artists, designers and engineers! Marvel’s Guardians of the Galaxy premieres in theaters tomorrow, August 1st, and I strongly feel that Rocket Raccoon is going to rocket in popularity. The alien is already featured in toys and merchandise for the film, and he’s got an interesting personality that I think will reel people in. Cyber Bunny Cosplay put together a great Rocket costume earlier this year, and she looks amazing as the gun-toting creature. 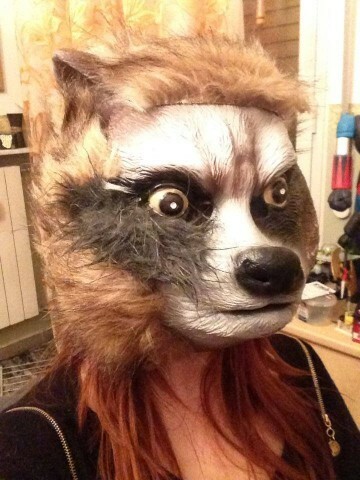 She used fur, modified motorcycle gear, an orange prison-style jumpsuit, and a creepy plastic raccoon mask that she covered with faux fur. That giant gun? 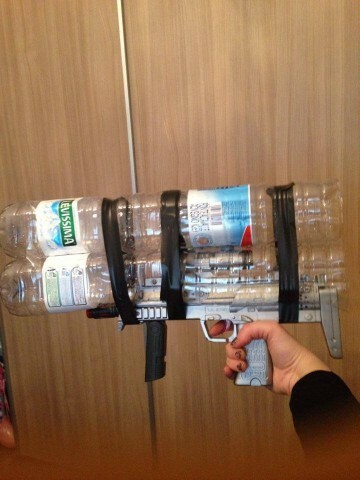 Made with a prop weapon base and four water bottles. There’s plenty of creativity on display in her work in progress album for the costume.